Kathryn was the managing partner of Diemer, Whitman & Cardosi, LLP, which she founded in 2003. The firm has grown and the core values remain the same--commitment and integrity. 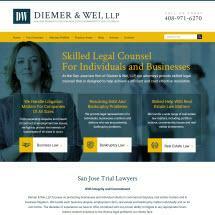 Diemer & Wei, LLP serves their clients by seeking smarter and compassionate solutions to difficult business and real estate disputes.